Federal Medical and Dental College (FM&DC), Islamabad is the first public sector medical college in the capital city of Pakistan. The College after inspection by Pakistan Medical & Dental Council (PM&DC) on 28th March, 2011 was initially awarded recognition for the degree of MBBS for 50 seats only. However, subsequently after re-location to new campus at NIH premises this award was enhanced to 100 seats after due completion of PM&DC rules & regulations. 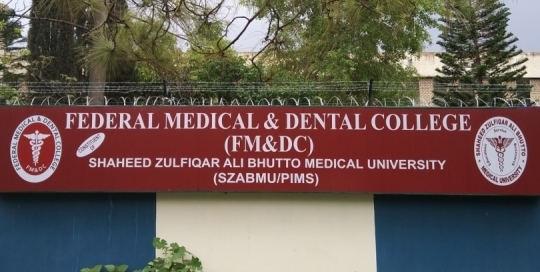 The Prime Minister has been pleased to make Federal Medical & Dental College (FM&DC) as “Constituent” medical college of Shaheed Zulfiqar Ali Bhutto Medical University (SZABMU), Islamabad.